Systems Value - HBP Asia Project Management Ltd.
Key to the successful delivery of any project is recognising the critical need for ‘backbone’ control systems, which can guarantee the objectives set for projects. 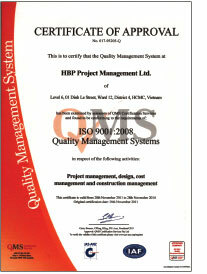 HBP is a QMS ISO9001 quality approved company, with systems tailored for operation in Asia. We understand the difficulties associated with construction in Asia. Obtaining and maintaining ISO9001 accreditation is a confirmation of our commitment to the customer that a first class service shall be provided jointly by our company, staff, sub-consultants and contractors. Quality management is central to all of HBP’s activities. Facilitating international standards of design, HBP employs a full suite of engineering design and design collaboration software allowing designers from around the globe to efficiently and often remotely collaborate on the design of projects in Asia.